Th-INK-ing of You: Welcome to Midnight Madness Sketch 36! Hello everyone! Welcome to Midnight Madness Sketch #36. First, congratulations to this week's winners! Bunny Zoe's Crafts ships worldwide and as well as stocking rubber stamps from around the world is an excellent source for your charms and flat backed pearls. They sell a fantastic range of personalized stamps and unusual ribbons like their popular Jute, Sisal and Raffia Lace. They pride themselves in their customer service and all orders received before 4pm are shipped the same day! The prize package this month is worth over $100.00! See THIS post to see the full package! D'Amour Allure stamps range from vintage styles to character art. Please browse the collections at their exclusive retailer, www.mcmahonfivedesign.com. My card is made with one of the D'Amour Allure images, Doris Mae. I embossed on glossy cs with Ranger Super Fine Detail Embossing Powder, watercolored with SU! Markers and cut out. The dp is BasicGrey Sugared. Base is Bazzill and matting is Textured Gold by the Paper Co. The diamond is made from the diamond pattern of the dp rather than cutting a true square and setting on point. Lace, Pink Brads, Gold String from my stash. Hi Grace!!! This is just gorgeous!! I just love your vintage style on this card. The pink and green with all the details of elegance is stunning. You sure rocked this challenge and the image my friend!! Your creations always wow me. Grace, your card is just beautiful! Love the gold/green and pink together. You have really created such an elegant card! It is so nice to have you with us this month! You are very inspiring! Grace your Vintage creation is exquisite!!! All of your elements make this so satisfying to look at. I especially love your lace up treatment that looks like a Victorian boot that this lovely lady might be wearing under her gorgeous dress!!! Simply divine. So great to have you on board with us as our Guest Designer...you motivate and stimulate us with your creativity!!! You have made this so gorgeous! I really love the pink and feminine feel of this card. So elegant and full of details. So impressive!! Grace, your creation is spectacular! I am in awe of this one! The pale pink is my fav color and matched with the gold and green is just beautiful. I love the lacing effect and the flowers are a perfect touch. Every detail on this one is just stunning! Thanks for sharing your talent with us and it's such a pleasure to have you on the team this month! 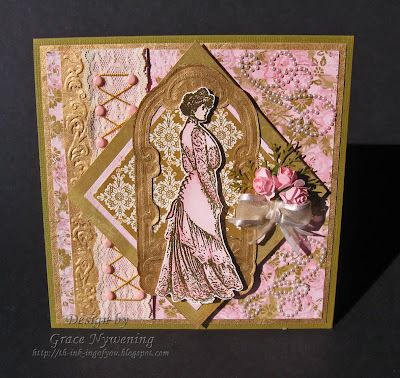 Ohhh wowww Grace,what a BEAUTIFUL card,i love your image and colours. I love the lacing with the brads. It's just so fitting for that image. 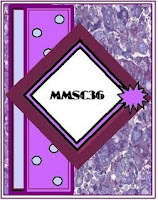 Beautiful card, I LOVE these colors!!! Grace wow!! Your Cards are so very Beautiful always, God has Blessed you with a wonderful talent. I love stopping when I can to see what you have created . have a Wonderful & Blessed week. Grace this is just stunning!!!!! WOW!!! Delicious colours and delightful image = a beautiful card. Be very careful if you make a women cry, because God counts her tears. The women came from a Man's rib not his feet to be walked on.. Not from his head to be superior.. but the side to be equal! Under the arm to be protected and next to the heart to be loved.. Put this on your status if you agree and pass it on. Wowwwwwwwwww!! Your card is positively stunning, Grace. It is so feminine and I love the lacing....perfect touch! Oh Grace, She's so feminine and beautiful! I'm so glad you used Doris Mae! I named her after my Grandmother we lost almost a year ago. She didn't look anything like this stamp! LOL! She was short, round and full of attitude! But her spirit was beautiful just like this stamp! Thank you for creating such a lovely card! I'd like to add it to my gallery if that's ok? Grace, This card is INCREDIBLE!! Just so dainty and feminine and wonderfully colored. AWESOME embellishments!! Just a beautiful, beautiful creation!! I am in awe of your talent!! 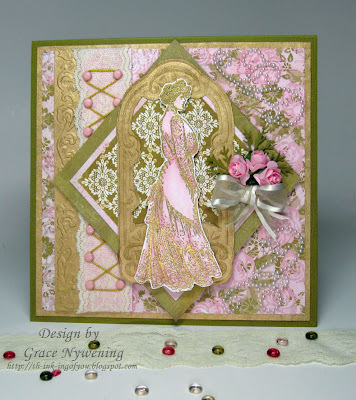 How did I miss commenting on this lovely card..I love the colors and the way you laced the side. Neat take on the sketch.